Vaccinations are an important part of your dogʼs or catʼs health care routine. 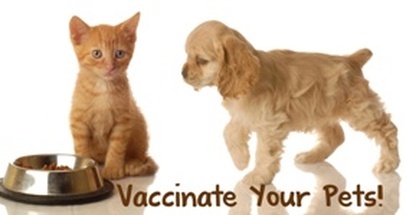 By vaccinating your pet you help protect your family friend from various diseases including rabies, distemper, parvovirus, infectious hepatitis, Bordetella, feline leukemia and others. Follow up vaccine every 3 years. Follow up vaccines every 3 years. Follow up vaccines annually. If required by facility may be given every 6 months. Leptospirosis -Given to dogs that are outdoors for moderate amount of time. (e.g. taken on walks or hikes, exposed to areas where wildlife can be. Feline Lukemia FeLV -Given to cats who are allowed any access to the outdoors.